HelloEar aims to make headphones more comfortable with a custom fit | What Hi-Fi? These in-ear headphones, called the Arc, are molded to your ears. You can have them wired or Bluetooth-connected, with GPS, noise cancelling and health-data tracking on its way. Uncomfortable headphones are a terrible thing and, now that we're living in a world of wireless earbuds following Apple's Airpods, having them fall out can mean going back to the shop for a replacement pair. 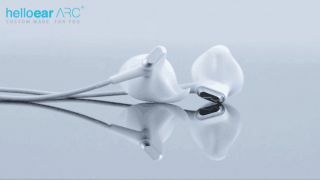 HelloEar is looking to avoid all that with Arc, wired headphones custom-designed for your ears for painless, effortless listening. According to the company's Kickstarter page, "you simply take a photo of your ear with a coin and our advanced ear recognition algorithm will customize perfect Arc earphones just for you." As on many wired headphones, there's playback control on the cable, but the company is also looking to add GPS, noise cancelling and health data tracking into its cans. You can also add a Bluetooth sports module to make these headphones wireless. A two-hour charging time will give them a claimed battery life of eight hours. This might be a prudent investment, if future smartphones like the Galaxy S8 keep removing their headphone jacks.